With its position in the center of the Balkans, Serbia has for centuries been a turbulent crossing point of the East and the West. This turbulence has created a unique cultural spirit and the philosophy of living stating that living consisted of a series of moments filled with small pleasures.Welcoming the guests with an open heart, plum brandy i.e. Slivovitz and preserve, has always been the most important part of the Serbian tradition. Following the ancient customs of hospitality, guests are offered alluring specialties of Serbian cuisine. Every bottle of Ethno spirit is the product of long labour and careful preparations, from hand picked fruit and herbs to jealously guarded “secret” recipes entrusted for centuries only from one generation of a family to another. Everything is prepared in accordance with the tradition and every recipe is a unique mixture giving away specific ethnical and cultural heritage. Especially for you, we have prepared three traditional spirit drinks, using carefully selected and analysed traditional methods and recipes, perfected during the centuries of use in village households. 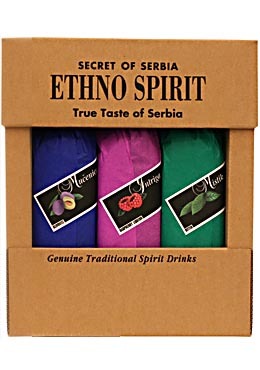 Ethno spirit brings satisfaction of traditional Serbian hospitality into your home where you can enjoy it with your guests and family.